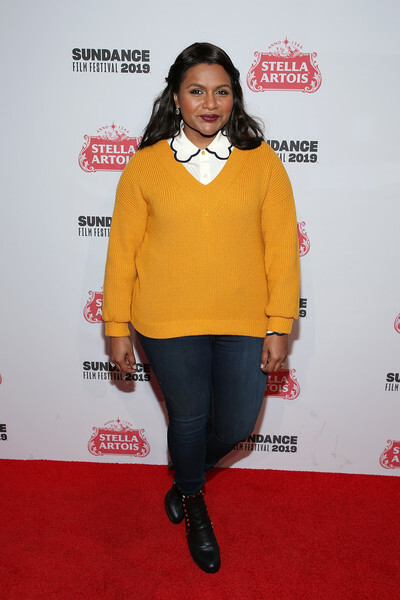 Actress Mindy Kaling attends Stella Artois & Deadline Sundance Series at Stella's Film Lounge: A Live Q&A with The Filmmakers of "Late Night" at Stella's Film Lounge on January 25, 2019 in Park City, Utah. A pair of studded black boots rounded out Mindy Kaling's attire. Mindy Kaling continued the casual vibe with a pair of skinny jeans. Mindy Kaling layered a mustard V-neck sweater over a collared white shirt for the 'Late Night' Live Q&A.